The following article was published ten years ago but yesterday's global announcement of Al-Shabaab Islamist organization asking its supporters to blow up shopping malls across the world and specifically the Mall of America in Minneapolis shows the best the reality of radical Islamism in our times that it is a criminal organization and those it targets have not necessarily insulted Islam nor are they the so-called imperialist lackeys. Those who are supposed to be killed by the order of Al-Shabaab are like the virgin girl who is noted in the Aztec example in the following article. Meaning a person who is totally innocent and the reason for choosing her to be sacrificed is for the goal of showing the declining forcers as powerful to create fear among their own followers whose belief in the faith is getting weaker with every passing day. 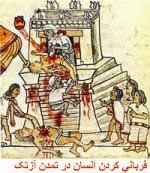 The Middle Eastern Empires are going thru a rapid decline of inefficiency reminding one of the last centuries of Aztec in the American continent, where the Aztec priests increased human sacrifice, not only to cover their decline, but basically to ensure the obedience of their own adherents, in face of the death and decline of the old order, including the disintegration of religion of Aztec itself. Islam maybe growing in Africa, but it is falling apart in its strongholds of Middle East, in Saudi Arabia and Iran, where people are getting disenchanted with Islamism and are looking to secular alternatives. We are living in an era where the collapse of the old world is happening all around the globe, and the highest resistance is where the society in the last half century has been the most stagnant relative to its wealth, and that is the Islamic world, which remained untouched thanks to its oil income. In contrast, in many other parts of the non-Western world, such as India, Far East or South America, the West had to make drastic changes, to be able to make the work force efficient for its own needs, and the role of local rulers was more than just being the custodians of a natural resource like oil. As long as the oil in its simple excavation could be a wealth heaven for the West, the Islamic world was able to stay unchanged. This is how modern social changes of 100 years ago, reflected in movements such as the Constitutional Movement of Iran, were retracted by the West, to appease the Islamic leaders, as long as they did not disrupt the Western interests in the Middle East. But the current crisis of industrial society is impacting all the Middle Eastern enterprises, and they cannot keep being in their untouched semi-feudal inefficient structures anymore. From Saudi Arabia to Iraq, even the production of oil is extremely inefficient, and is itself part of the crisis, and these societies cannot continue to exist as before. The crisis of industrial world and the glacial changes to a post-industrial society is addressed by two opposite trends. The first, i.e. the futurists, look to post-industrial economy and politics, to address the crisis of the present, whether in the former Soviet Union and Eastern Europe, or in the United States and the Western Europe, or in a third world country like Iran or Singapore. The second, i.e. the retrogressive forces of the past, such as the religious fundamentalists, look backwards to the pre-industrial society, for a solution to the current crisis. Has the dominance of power in Iran by the Islamic clergy caused the current conditions? If so, then why the same crimes of Islamism can be seen in Bangladesh, Pakistan or Nigeria, where those countries really do not have a theocracy. The truth is that what we are witnessing in the world is way beyond the issue of theocracy. Is it just because Islam has not had its Reformation and Renaissance? No, the problem is even beyond the issue of Islam itself. Basically Islamism is the representation of a strong resistance to the collapse of the old order in the Middle East, and this is done by resorting to the murder of whoever is questioning Islam's fundamental tenets. Thus the brutality of Islamist fundamentalists, their beheadings, and fatwa killings (1). If in the prehistoric times, there were religions that justified human sacrifice, and if in Medieval Times, there were religions that justified burning of the blasphemous live at the stakes, in this 21st Century, there is the *organized* religion of Islamism that kills opponents by *fatwa* (2) of its religious leaders, and the Islamist mob carries out such heinous crime orders, for insulting their prophet and other idols. Even more moderate clergy, like Ayatollah Montazeri, in one of his last interviews (3), still did not reject mortad killing for those x-Muslims who are belligerent towards Islam. I think the world should put an end to viewing the criminal *organized* religious views of Islamism as a private matter, the same way that *organized* political views of Nazism are not considered as private matter. Nobody would have considered the burning in the concentration camps as private matter of a Nazi faithful. The world does not need another WTC, another Salman Rushdie, another Taslimeh Nasrin, to see that these organizations are criminal mobs, and being religious or not makes no difference. Of course they can be outlawed if they act on their ideas. If there was an organized religion in today's world which allowed sacrifice of virgins as its sanctioned practice, it would not be viewed as some fantastic private religious belief, and would be viewed as a murderous organization, not much different from mafia, and such an organization would have been dealt with by police authorities as a criminal *organization*, and if they sacrificed a human, such actions would not be considered as religious freedom. The global community and the United Nations, must deal with this peril of our times, the murder fatwas of Islamists for blasphemy and insult, and all organizations that plan and act on such criminal practices, must be outlawed, along with the other terrorist organizations. What difference does it make if they call themselves a religion. The platform determines if it is a criminal organization or a peaceful association.